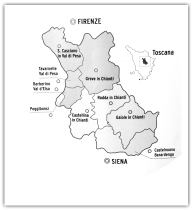 Masnaghetti's first detailed map, of Barbaresco, appeared in 1994 as a free supplement for subscribers to Ex Vinis, a kind of Wine Advocate of which Masnaghetti was the editor. A great many copies were printed and Masnaghetti tells me that they were stacked in the office for a long time as, due to limited interest, they proved to be a hard sell. Still, this did not deter Masnaghetti from setting up his own periodical, Enogea, in 2005, a bi-monthly newsletter (he himself calls it a monografia di terroir) in which the groundwork for the maps is published, including an overview of a particular region, a comprehensive tasting of the most important wines and, of course, maps. The newsletter, which is completely void of advertisements, finances the production of the maps, of which some 14 have now appeared. Rich in detail, the maps show all vineyard plots, the exposure, the division into subzones and every producer in the region. See here for an example. 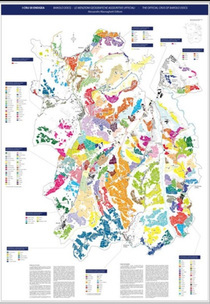 Most of Masnaghetti's expertise in mapping a region comes from his extensive work in Barolo, a patchwork of many vineyards with shared ownership, and a large number of individual producers. He starts by taking photographs such as this, which become the basis for all further investigations. I asked him whether the local land register is not the first port of call but according to him that information is not always publicly available, nor readily accessible. The next step is to get a comprehensive list of vineyards, and here you see the Veronelli signature. But Masnaghetti goes much, much further, by visiting every producer of the region. When I asked him, astonished, how that makes sense, he told me that he never overlooks a single one, especially in the case of shared ownership of such highly priced land as Barolo. Neither would he easily consider doing the work as a commission for a producer consortium, as it is against his spirit, he said. He is also wary of possible arguments over where a certain cru vineyard ends and another, lesser plot begins. Masnaghetti told me that in case of a dispute, his role as journalist is as useful as his experience. According to him, when you see a hill covered with vineyards, it may look like any other hill, until you start to observe it closely and, if you have the passion, according to Masnaghetti, 'the hill will speak for itself'. For example, a very good indication for quality, or the absence of it, is the actual planted vine itself, as it 'cannot lie'. In Bussia (the famous cru in Monforte d'Alba) you find Dolcetto in certain plots where Nebbiolo cannot be ripened satisfactorly or where the quality of the fruit is too modest. This gives a perfect indication of where the best plots are and that not all the plots within the traditional cru borders are equally good. The same goes for snow, another fantastic parameter: where it melts first, you will find the warmest spots, and hence the best terroir for Nebbiolo in this case. Sometimes there are historic recordings (for example the first maps of Barolo by Renato Ratti, which he drew up in 1979 on the basis of earlier historic material) on which he can literally draw, but this is not often the case. Producers will speak too, but they may not be able to tell Masnaghetti exactly what he needs to know. It is because of this that he considers it of the utmost importance to speak to each and every single producer, because the wide range of sources will give more balanced information. Apparently, he has yet to meet a single producer who refused to cooperate, or allow him to walk into his or her vineyard to investigate directly or to have the panoramic point of view needed to draw the vineyards. I asked him if his demarcations are sometimes smaller than those of common wisdom or as indicated by other maps. He confirmed this, but he also claimed that there has never been any real dispute once the maps come out, as his criteria are completely clear and verifiable and each plot is described accordingly. But he is wary of mapping vineyards that are in the process of being officially registered, for fear of seeing his map rendered useless. This is why he has only partly mapped Serralunga and Monforte d'Alba since these communes are still working on an official delimitation of their crus. However, he has already observed that the communes of Barolo and Monforte d'Alba have created crus that more or less encompass the entire commune, while Serralunga and Castiglione Falletto have really worked out the best single sites within their borders. When I asked him how much time it took to map Barolo, for example, Masnaghetti mentions only three to four months, without the producer visits, that is. But I expect that it would take at least double that time for any normal person who was less of a workaholic. He visits about 10 producers a day. During those visits he doesn't taste wines (he requests samples to taste at home), but asks for permission to go into the producer's vineyard alone. There he investigates vines, soils, exposure and correlation to neighbouring plots, while considering any aspect of the landscape that can give clues, even absent ones. For example, in the Langhe the lowest parts of any hill would consist of trees and shrubs because these spots were considered too cool to ripen grapes satisfactorily. Nowadays in more and more of these sectors trees have been replaced by vines. Is there no history of terroir in Italy, I asked Masnaghetti, thinking of France. He denied this, while stating that the notion of terroir and cru nowadays is inflated. Because yields in top-quality regions are today so much lower than they once were, wines that were once mediocre are now much better - so much so that it is increasingly difficult to distinguish between very good and great wine, especially when tasting wine when it is young. However, he thinks the real problem, at least for Italy, is not the absence of a cru but the fact that it is communicated badly or not at all. He says that if he were to visit a region and ask the producers about the specific characteristics of the region's wines, most of them would not know what to say as it is not on their horizon - not yet at least. At the end of our discussion, I wanted to know what the drive was for this enormous work. Masnaghetti grins and says per divertirmi, to amuse myself. But the real reason is surely the satisfaction of accumulating knowledge in order to map a terroir and to transfer his passion to other wine lovers. At least as important to him is to express the fact that wine is so much more than an alcoholic drink. And then, again grinning, he told me that it also gives him great satisfaction, even if he knows only 90% of a given region that he has mapped, to know that he knows it better than most producers there. This knowledge Masnaghetti is more than happy to share with wine lovers, at the incredibly reasonable price of €7 per map. This excerpt was taken from Walter Speller's originally published article "Italy's vineyards mapped foot by foot" on jancisrobinson.com, for a link to the full article click here.